Save over 40% on all removable murals in my Faux Wood Wallpaper Sale! Plus get FREE SHIPPING within North America. The sale only runs until February 26, 2019. Check out all the wood mural designs or here are a handful of designs that are a part of the faux wood wallpaper sale. 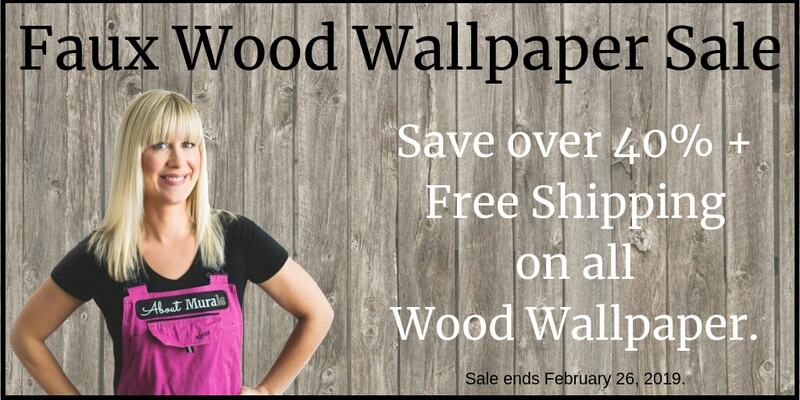 Want a reminder of my next Faux Wood Wallpaper Sale? Did you miss the faux wood wallpaper sale? Join my newsletter community and I’ll send you a notification of any upcoming sales! I spend hours every month adding customer photos of my murals in action…in their homes…to help you decide if the design is right for you. Check out my blog for the latest inspo!